As show organizers we recognize the range in experience and professionalism between individuals and companies, and we have programs that recognize the top professionals at each of our events. Today we thought we'd share a few of samples of the lead generation results from a recent event, so lab suppliers in the field can start a conversation on sales best practices, target market relevance, and how to best provide the research marketplace with the information regarding tools, reagents, supplies and methods. To maintain the competitive advantages and confidentiality of individual companies participating in our events, we will be speaking very generally. These survey results are from a recent show where the attendance was over 300. Only "completed" surveys were used for this comparison. Surveys with blank fields were not used. As always a variety of products and product price ranges were present at this event. The range of results shown here are fairly typical of what we regularly see at similar events. How many people came by your booth? How many were good to excellent leads? What is the average price of your product or service? What was Company 1 doing differently than company 16? How did the displays look? 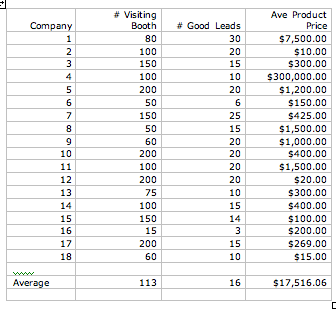 How did companies 5, 10, and 17 draw so many to their booths? Is my product right for this specific research market? Each research community has a slightly different blend of research sub-specialties, how does this market match up with your products' strengths? Does my sales staff feel comfortable with the science behind my products? Are they new, new to this product line, new to a specific techniques or product application? Is my marketing message clear and relevant to this market? Is it clear to passers by and is it conveyed clearly by the sales staff? Is my booth display organized and visually appealing? Are boxes, coffee cups, wrappers and non essential items packed out of view? Are product samples neatly displayed and is product literature relevant and easy to reach? Is my sales staff available and receptive to this audience? Are we checking email, voice mail, and social networks during show hours, are we completing reports, talking to family and friends, or away from the booth casually or even professionally networking when we should be at the ready for researchers coming by with questions? Does my sales staff actually want to be there? Were they "sent" to the show when they had another commitment or do they have other issues about the space, time, location, atmosphere, audience or anything else related to the event? Does my sales staff have the science vendor show sales training necessary to succeed in this type of environment? Its worth taking them through through their paces before the actual event can help you spot areas that need fine tuning, build confidence in your team, and make the entire event more productive for your company. Biotechnology Calendar, Inc. connects researchers with the resources they need to succeed in the competitive world of life science research. To see our 2012 event schedule, exhibitor information packet, loyalty programs, or to request funding statistics for the universities associated with any of our events, just click the appropriate link. If you'd like to see how all of the other surveys stacked up from this event click here to request the details.